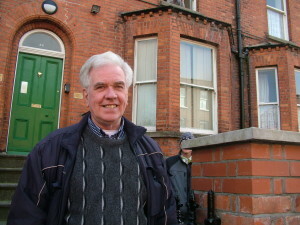 Homelessness campaigner, Fr Peter McVerry, has warned that the Government’s Action Plan for Housing and Homelessness, ‘Rebuilding Ireland’, is doomed to fail due to its flawed approach. His criticisms of the Government’s efforts are part of the Jesuit Centre for Faith and Justice’s (JCFJ) response to the strategy, which warns that ‘Rebuilding Ireland’ relies far too heavily on market-based solutions to the problems facing Irish housing. In a statement issued on International Day for Eradication of Poverty, the JCFJ warned that the plan is set to fail in its stated objective of developing a housing system that is ‘affordable, stable and sustainable’. On Tuesday, Fr Peter McVerry highlighted how despite the efforts of Government over the fifteen months since ‘Rebuilding Ireland’ was published, homelessness has increased by 27%, asking prices for houses rose by 12%, new rental prices increased by 11.8 %, and the availability of rental properties within the limits for the various rent supplementation schemes diminished. “The policy of the past twenty-five years has led to a chronic under-supply of real social housing. It has resulted in the homelessness crisis we are now experiencing, and in the trebling of the number of households on housing waiting lists between 1996 and 2016,” the Jesuit said. He also highlighted that the various schemes, including Rent Supplement and HAP, over the period 2011 to 2017 will total around €3.8 billion. In 2018, €729.5 million will be spent on these schemes – which is €2 million per day. “And from all of this expenditure, there will not be a single additional unit of housing added to the publicly-owned stock,” Fr McVerry criticised. Ms Burns said the Jesuit Centre is calling for a new direction for housing policy in Ireland, one based on recognising that housing is a fundamental human right. Ireland gave a commitment to implement this right when it ratified a number of international human rights treaties, but ‘Rebuilding Ireland’ does not even mention the right to housing, she highlighted. According to the Jesuit Centre, there needs to be a very significant increase in the provision of local authority housing, along with increased supply by approved housing bodies, co-operatives or some new not-for-profit entity. Furthermore, it says, the principle that ‘social housing need’ will be met by housing of this type must become a central feature of Irish housing policy. This would mean reversing the policy of successive governments of relying on rent supplementation of different kinds as a way of meeting long-term social housing need. ‘Rebuilding Ireland’, it says, proposes the continuation and intensification of this approach. Other Policy Actions which the JCFJ says are needed include the urgent development of publicly-provided ‘cost rental’ model of housing, to ensure a more affordable form of rental than is provided by the private sector. According to the JCFJ, if supplied on a sufficient scale, this type of housing could promote social integration and address the needs the large number of households now having to spend a totally disproportionate share of their incomes on rent. In relation to the private rental sector, the Jesuit Centre says that given the pace at which rents are rising throughout the country, rent regulation should now be extended to all areas, but that permitted rent increases should be in line with the Consumer Price Index only. It also urges further measures to increase security of tenure and to ensure that regulations regarding standards are met. However, it says that there is need for realism as to how much of a role the sector can play in meeting Ireland’s growing housing needs – ‘Rebuilding Ireland’s expectations of what the sector can supply are, the Centre suggests, out of line with the reality of how private rental actually operates in Ireland. On the price of housing, the JCFJ says that there is need to reduce the price of housing, so that it is no longer so out of line with other indicators such as earning and the Consumer Price Index. Otherwise, there will be a continuance in the decline in home-ownership which has occurred since the early 1990s, and has resulted in Ireland now having an ownership rate that is below the EU average, with only five other Member States having a lower rate. The journal includes analysis of the proposals in ‘Rebuilding Ireland’ by Peter McVerry SJ, Margaret Burns and Eoin Carroll of the Centre, along with Dr P.J. Drudy, Emeritus Professor of Economics TCD, and Dr Rory Hearne, of Maynooth University Social Sciences Institute. International Day for Eradication of Poverty was established 25 years ago by the UN. It challenges leaders and policymakers to put in place appropriate social protection systems and measures that cover everybody, especially the most vulnerable. In his Angelus address on Sunday, Pope Francis said, “poverty has nothing to do with fatality: it stems from causes that must be recognised and removed”.